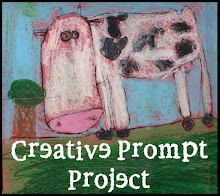 Every month or so I have been going on and one about various projects on which I need to work. It occurred to me that some of the projects are so old that I should haul them out and take a new photo. I sighed hugely at the work involved in that little project, because some of them are well stored. I do think it is a good idea not just for you, but for me as well. I started with something accessible. The last time I looked at these pieces and parts was in 2014. 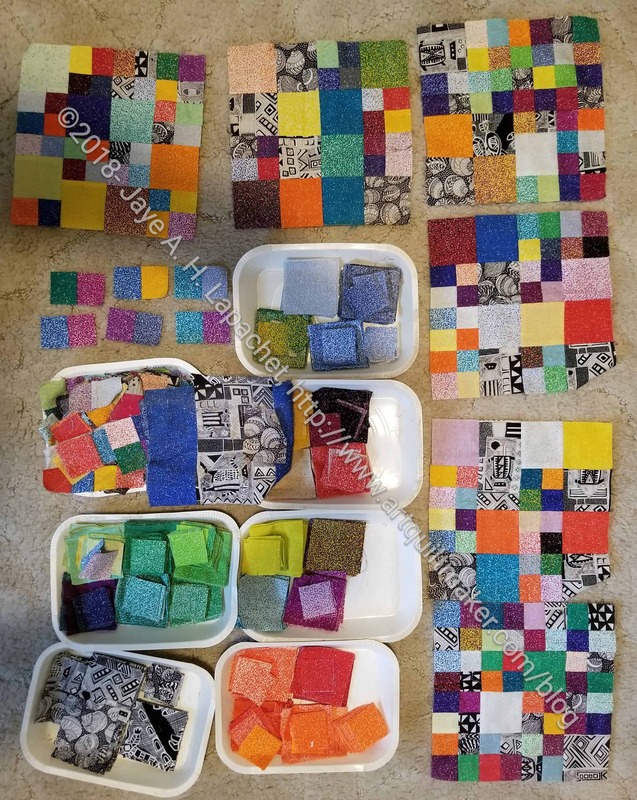 The pieces and blocks for Pointillist Palette quilt n.4 (??) are in my sewing table, so I was able to pull them out (and shake them off a bit) fairly easily. The reason I think this is a good exercise is that I can see what I have. As you can see I have 5 blocks already made and many squares cut. I am sure I need at least twice as many blocks, but this is a good reminder of what I have. 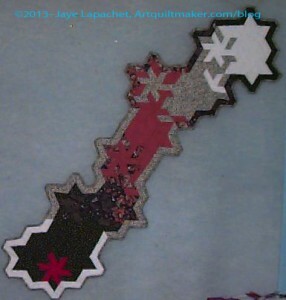 Also, looking at the pieces and parts reminds me I need to look at what my original idea was for this quilt. Was it a Night theme or did I already do that. 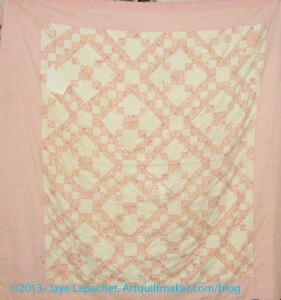 See the other Pointillist Palette quilts in the Gallery. I was thinking about Marrimeko fabric the other day and this quilt came to mind. 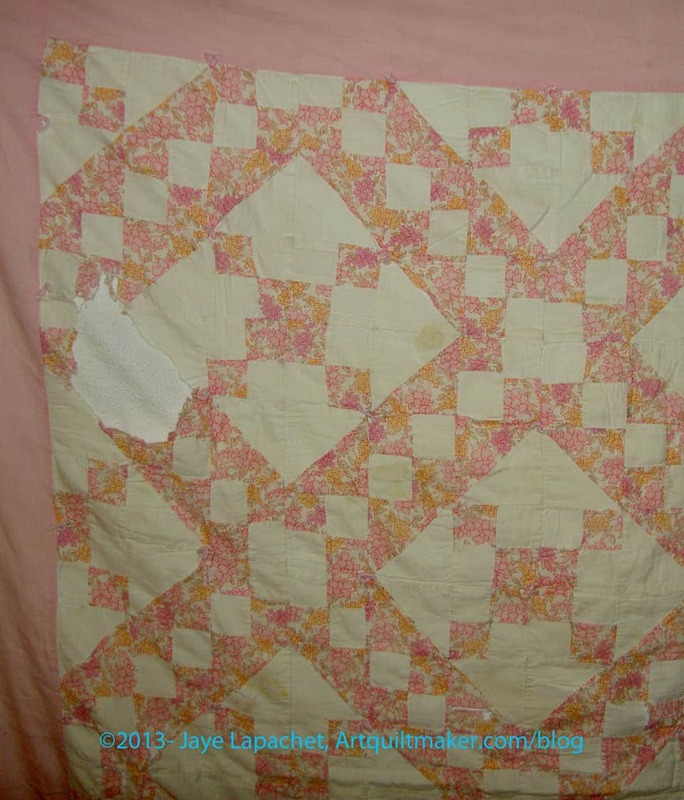 This quilt is pieced, but the smaller sections are not pieced. They are panels. They were already cut when I bought them at the Crate & Barrel outlet, so I sewed them together to make a quilt for the baby I was expecting. Machine quilt was something I was building as a skill with the new machine I had bought the year before so I decided to machine quilt it. 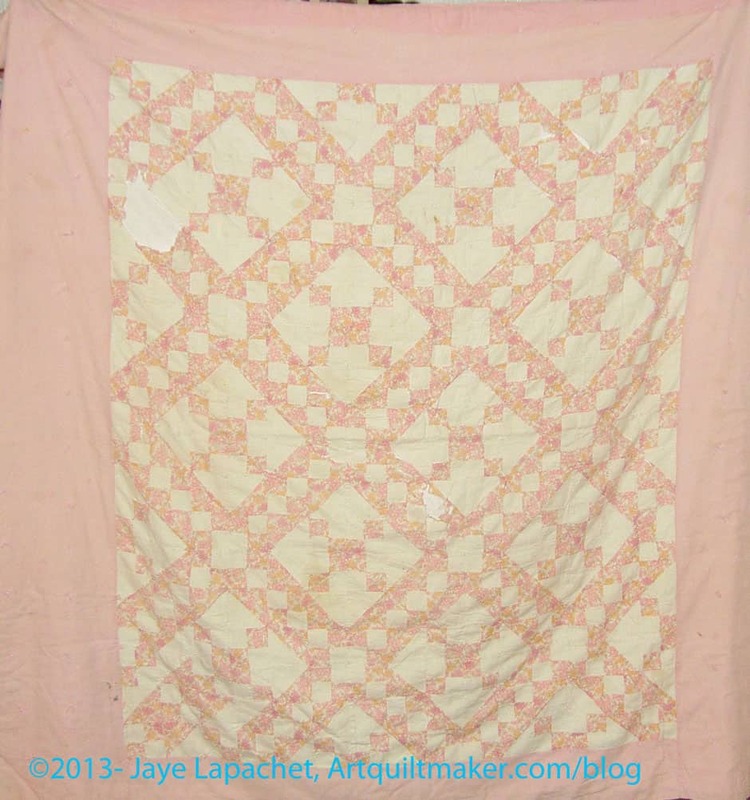 Basting has always been a trial, so I thought I was being clever when I used Wonder Under to baste the quilt. It stayed together while I quilted it, but the quilt is stiff as a board, practically. We never really used it for a baby quilt. We did use it as a playmat. I still like it and could put a sleeve on it and hang it up. This quilt was probably one of the last quilts I made until the YM was about 6 months, maybe a year old. I don’t often have something to show for Throwback Thursday. I received a box back from ScanCafe and I found an early photo of the Tarts Come to Tea. It is amazing to see how it has progressed and to realized that the quilt is still in process. Sigh. I started this quilt pretty soon after TFQ and I made She Had to Have Her Latte and I was still thinking that novelty fabrics would be a good idea. Those novelty fabrics were jettisoned at some point, but some of the elements stayed. Even some of the placement basically, stayed. I also started out using much darker fabrics. 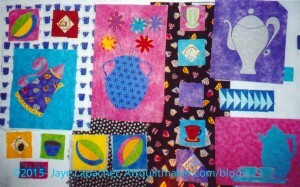 I do still have that vase, which I like and may make into another applique type quilt. I am not sure how I feel about these improvisational pieces now. Clearly, I am having trouble finishing the Tarts, despite keeping it on the list. A few weeks ago, Sandi, of Quilt Cabana Patterns, posted a playmat she made. It reminded me of Throwback Thursday (#TBT) and how Quiltin’ Jenny always posts something from her pre-blogging days. I wasn’t very productive in pre-blogging days, but I do have quilts that only show up on Artquiltmaker.com about which I have never written. 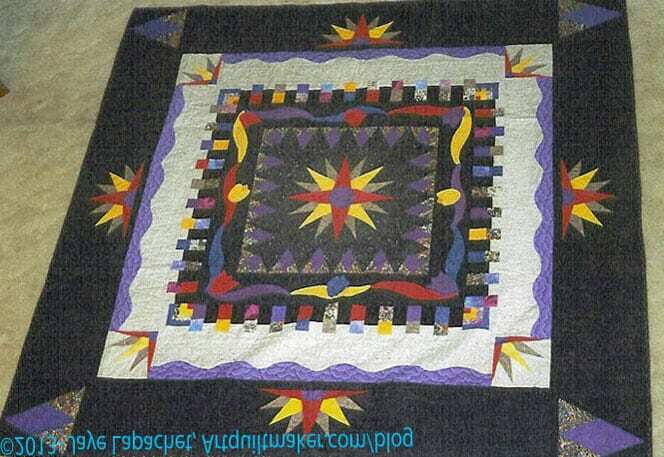 The Playmat is one of those quilts.I made this quilt in about 1997 or 1998. The Playmat was one of the first projects I worked on when I was a new mom. 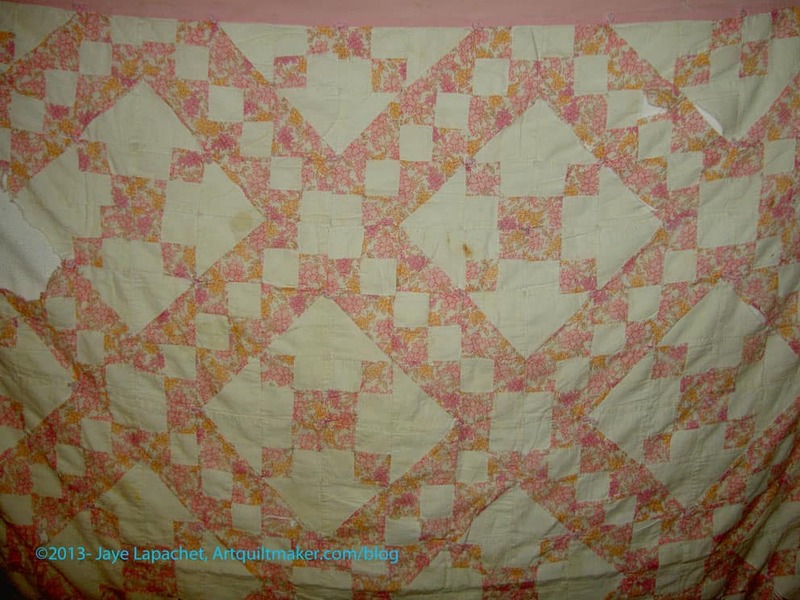 I hadn’t been sewing much, was only marginally connected online (remember this was in the dark ages with no Twitter or podcasts or blogs) via the QuiltNet listserv. I don’t remember why I decided I needed to make a playmat, but I really used it to lay out on the floor so the Y.M. (previously the Tiny Bubba) could lay on it. Later, he sat on it, but as soon as he started crawling, we used it briefly in the stroller, but he would throw it off and out, which became annoying. I made this quilt very quickly and used a pillowcase technique to avoid binding it, then quilted it myself. I notice now that the edge is all bias. Not sure what I was thinking, but the piecing is much more interesting (if the color combo doesn’t hurt your eyes) on point than a straight set. The back is a nice cute bears in King Arthur garb print. 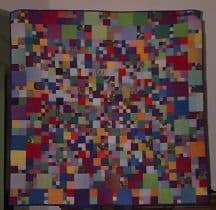 I know I didn’t want to cut it up and I used it for a quilt for Friend Julie‘s younger son as well. I’ll try and add that photo to this post. This is the first quilt I made on my Janome 9000 in about 1995. I moved up to the 9k from a Singer 201 that I bought at a White Elephant sale for about $30 including the table. The Singer 201 got me started in quiltmaking, but I outgrew it after about 3 years. The one thing I really wanted to do was machine applique’. The Singer 201 did not have a zigzag stitch. I was so excited to do machine applique’. I drew out a picture that became the center and stitched it out. I didn’t know anything about stitch density. 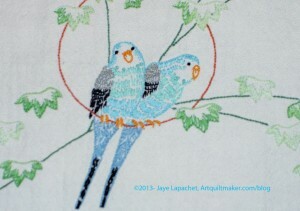 I used Mettler quilting thread for the stitches. and the satin stitch was really thick. I was really pleased with the center block when I made it. 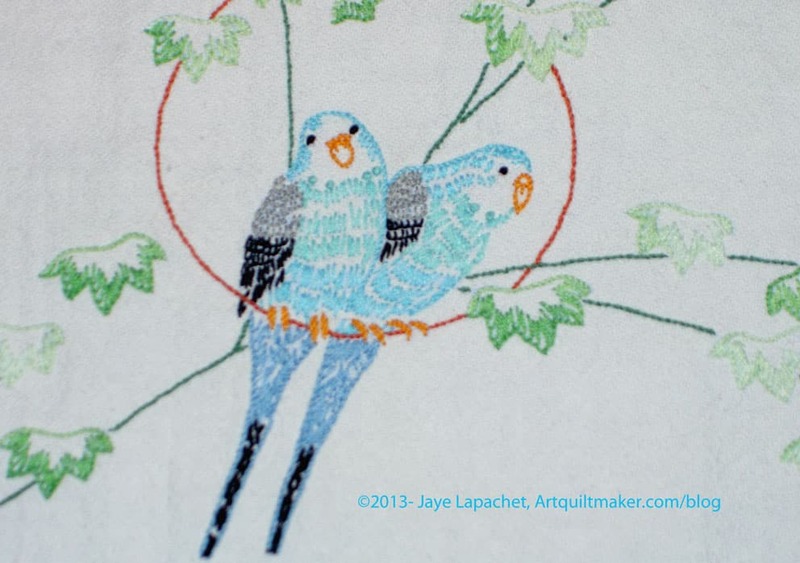 I can do much better now, but it really showed that a much better machine helped me take a huge leap forward in my quiltmaking. The new machine allowed me to spread my creative wings. 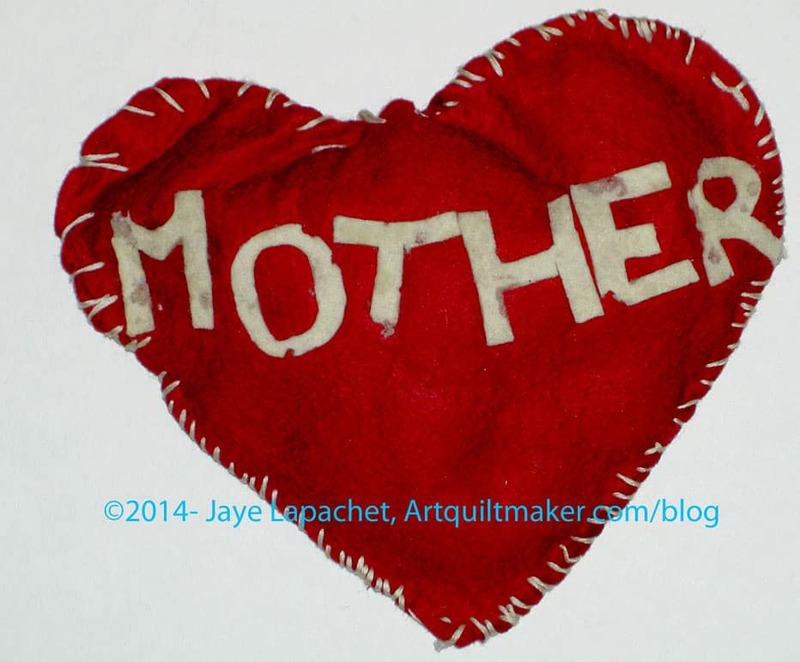 Vintage Tuesday: My First Sewing Project? Happy Tax Day! Hope you get a big fat refund! Recently Mom cleared out her storage unit. She found a lot of great stuff, like her jewelry box and some not so great stuff, e.g. my childhood in a plastic sweater box. I had mixed feelings as I went through the box. Clearly, these things meant something to me, or my mom, at some point, but, frankly, most of them I didn’t remember. I put them away. When I am dead someone else can decide to toss them. I did find this pillow, though, which I thought was very sweet. It doesn’t have my name on it, but if Mom says I made, I have to believe her. It looks like something I would do. I love the wonkiness of it. I also love the visible stitches. It seems heartfelt to me. It also seems odd, in a way, because I never called my mom ‘Mother’. That must have been the pattern. 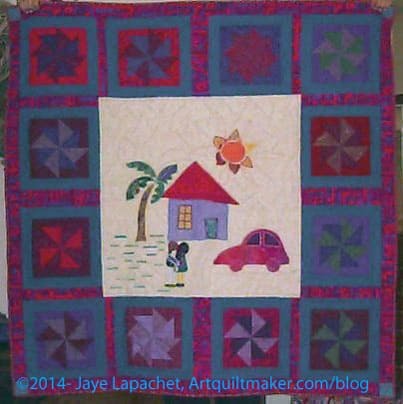 Author JayePosted on Tuesday, April 15, 2014 Tuesday, November 29, 2016 Categories 2014Tags Gifts, Off Topic: Crafts, Vintage Tuesday2 Comments on Vintage Tuesday: My First Sewing Project? March was an odd month, as I know I keep saying, so I am pressed for content. As a result, I decided to show some older quilts. I have a couple of quilts that have to do with war. As a mother of a boy, I am concerned about how easily our recent presidents seem to engage in war. I don’t see my son as expendable. This quilt was made before the Young Man was even a dream in my eye. This quilt was made as a gut reaction to the First Gulf War. I was sitting home alone watching CNN’s coverage of bombs falling on Baghdad, Iraq. After living in Austria, I know that people everywhere have moms and jobs they go to and children who need to be taken to music lessons and soccer camps. The type of war we have now does not spare civilians and that is of great concern to me. It is a reaction to war itself – the death, the devastation, the violence and makes no comment on the justification for that particular war or any others. It is also not a judgement of those soldiers who choose the military as their career choice. The military does a lot of good for a lot of people and I applaud those who choose that path. The background uses a technique by Mary Mashuta called ‘pushed neutrals’. The idea is to use several different fabrics in a similar range of hues to make a background instead of using one fabric for the background. This idea has lodged itself firmly in my brain and sometimes comes out these days as mosaic quilting. This quilt probably has the most organized and intentional use of mosaic quilting of any I have made. It reminds me that I can use it as a design option. 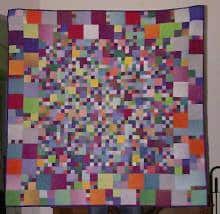 It also reminds me of low volume quilts which are such a craze right now. They use the same idea for the whole quilt rather than just the background. 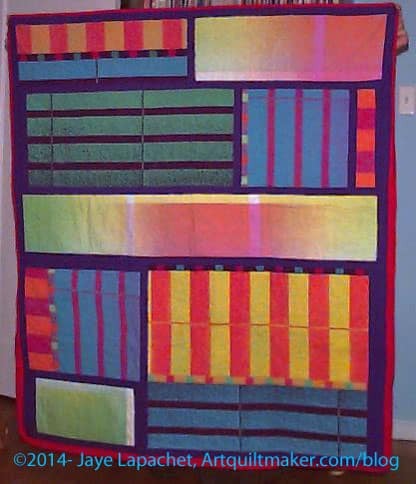 Although the subject matter is difficult, I think this is one of the best quilts I have ever made. It was shown at the San Francisco Quilters Guild show in 1990, with much controversy. It was on display at the law firm of McKenna & Cuneo, LLP from 1997-2000. I think I will need to take a better, higher resolution photo of this piece at some point. Periodically, I will find something interesting that is old and post it under the Vintage Tuesday tag. 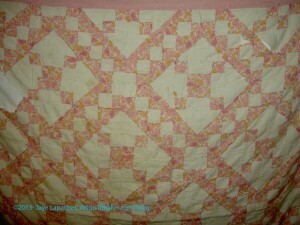 In this case, I am showing you an old quilt of mine. It can’t really be called vintage as it is only 24 years old, but you get the idea. This isn’t my first quilt, but I believe it was the first quilt I actually finished (the Sampler took me awhile, because of the hand quilting). It was finished in 1990. I did in response to a challenge posed by one of the members of the quilt group of which I was a member at the time. We were all on board and one of the other members went to pick the fabric. 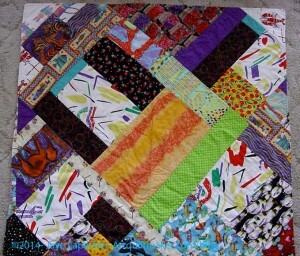 It is all machine pieced-NOT paper pieced- and machine quilted as well. Do you like that binding? I put the binding on by machine and then sewed all those miters down by hand. It was really a challenge to hang. This an embroidery that my grandmother made for my wedding and just gave to me. 1. I didn’t know she did cross stitch. Crocheting yes. Cross stitch huh? 2. I have been married for 24 years. Where has this piece been all this time? 3. Where did she find it? 4. How did she find it? Don’t get me wrong, I like it and will probably get it framed. It just seems very strange to me. I am tempted to tag these posts ‘Old Junk.’ I haven’t done it yet, but I am thinking about it. I must be on some kind of roll with my old quilts. This is Starry, Starry Night. Again, it is a 1990s project and I believe it was a round robin by mail project. Who can remember? Aside from my Mariner’s Compass center, I really like the border that looks like it is half in the black and half in the grey. I am almost sure this is one of the last, if not the last group project that I worked on. I thought of it after I decided to play along with the BAMQG Round Robin. Pink Spider Looking at the Stars is the first quilt I ever finished. * Note the word “finished.” I started my Sampler quilt and got to the quilting point and then stopped. Hand quilting was the order of the day and hand quilting takes a long time. I was a UFO girl from day one. Pink Spider Looking at the Stars was the result of a challenge in the small quilt group I belonged to at the time. We were given pieces of all (or most, maybe) of the fabrics and had to make something. 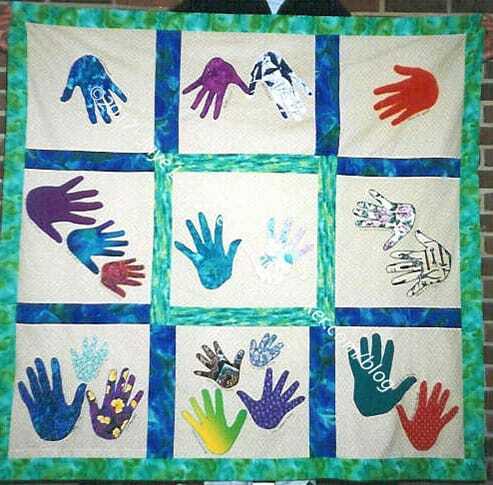 These quilts were displayed at an EBHQ show in the early 1990s, or, perhaps 1989. Again, I don’t remember. I don’t have any good photos of the quilt, but the quilt is around here somewhere, so I could take some if I were motivated to do so. One thing you might notice is that the design is insane. I made this piece with templates. I didn’t have a rotary kit at the time, though I think I may have bought one shortly thereafter. You might also notice all of those mitered corners on the binding. The binding was a pain, I have to admit. Most of the time now I keep my quilts square so as to avoid mitered corners. I subscribe to the notion that if you don’t know you can’t do something, then you can do it. Nota bene: hanging out in space without a space suit is the exception. 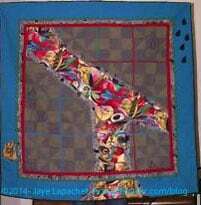 From an early quilt age, I could do Y-seams, which is why I know you can do them. Although these are 6 rather than 8-pointed stars, there are a lot of Y-seams. 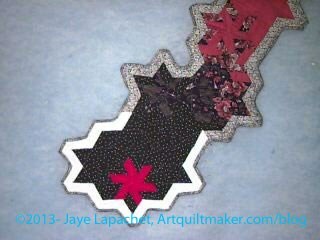 I had done an 8-pointed star in my sampler class and figured 6 would be similar or easier. Seeing this quilt might give you a clue as to why my hackles raise a bit when I see Half Square Triangles classified as “intermediate”. HA! I have a lot of needlework from my female ancestors. I am starting to have a hard time appreciating it, because It is taking up space in my cupboards and not all of it is my style. Yet I feel compelled to keep it. I know this is how the Young Man will feel when all the quilts I feel compelled to make are dumped on his living room floor when I am dead. 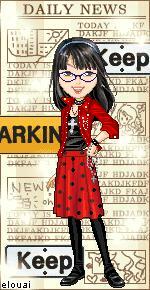 This dresser scarf is actually one of the pieces that I like and use. the birds look very cheerful in this piece. We had parakeets when I was a kid and, though, they were messy, they also made a cheerful noise. We had a green (Bilbo) and a blue one (Gandalf). As an aside: My mom named them, I think, because I would have never named them after characters in the Lord of the Rings series. 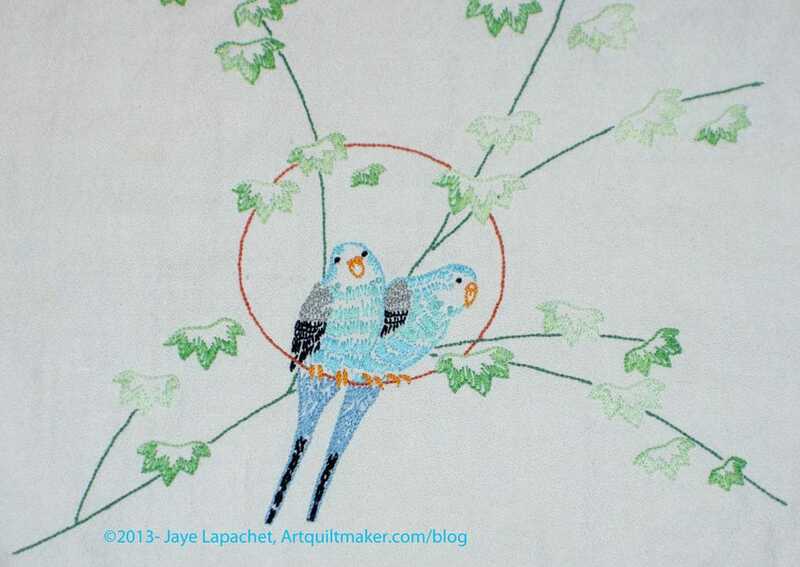 I like the embroidery because the cheerful personality of the birds comes through. I also like the way the stitching was done. It isn’t really dense, so the stitches seem to have some air to breathe. I haven’t ever seen an embroidery with this pattern before and it makes me wonder if it is unusual. I think this one must have been made by my maternal great grandmother, because of the tatting around the edge. I don’t remember my grandmother ever doing tatting. I looked for an image of the pattern, so I could give some background for those of you history buffs, but didn’t come up with anything. ‘The’ Google’s precision is really lacking. I would love to be able to filter more, but they have dumbed their system down enough that it is nearly unusable for difficult searches. I’ll add the information if I find it later. While I was visiting my Grama a few weeks ago, my mom pulled a quilt out of the cedar chest (I know! wrong on so many levels). A quilt? Huh? I really was confused because my Grama is a not a quilt person. She enjoys the one I gave her, but she doesn’t want more. I have no idea why I have never seen this quilt before. Apparently, my sister has known about this quilt for awhile and always uses it when she sleeps over at Grama’s. This quilt is referred to as Grandma Betty’s quilt. Grandma Betty was a woman who drove out to California from Chicago with my Grama, her brother (Uncle Gene), their father (Grandpa George, yes I knew him) and Grandma Betty’s daughter. I am not sure who drove, but Grandma Betty owned the car. I’ll have to ask Grama more about that trip. This is the first time I have heard this story and was amazed. 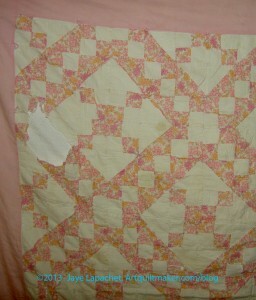 The quilt is in terrible condition, but has a lovely soft look and feel to it. 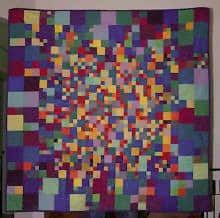 If my quilts look like this in 70 years, I will be happy. It means they were loved.